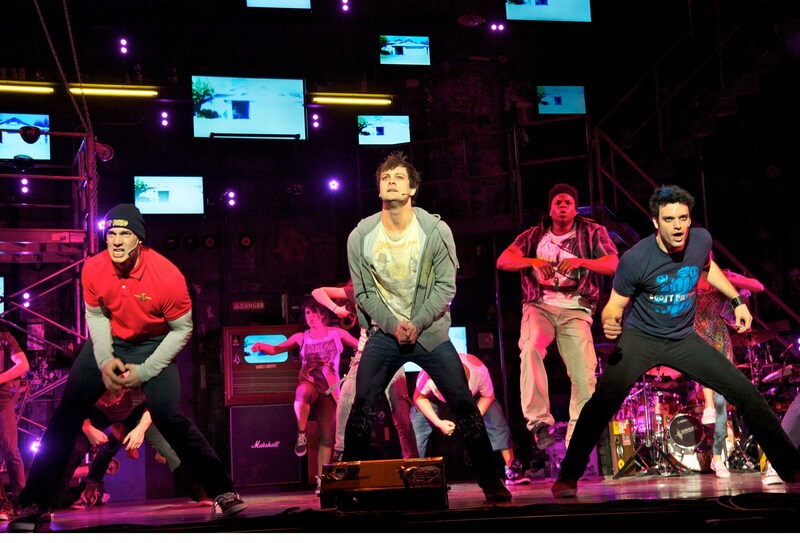 Stupendous In So Cal: Green Day’s Rockin’ “American Idiot” Is Anything But Simple-Minded! 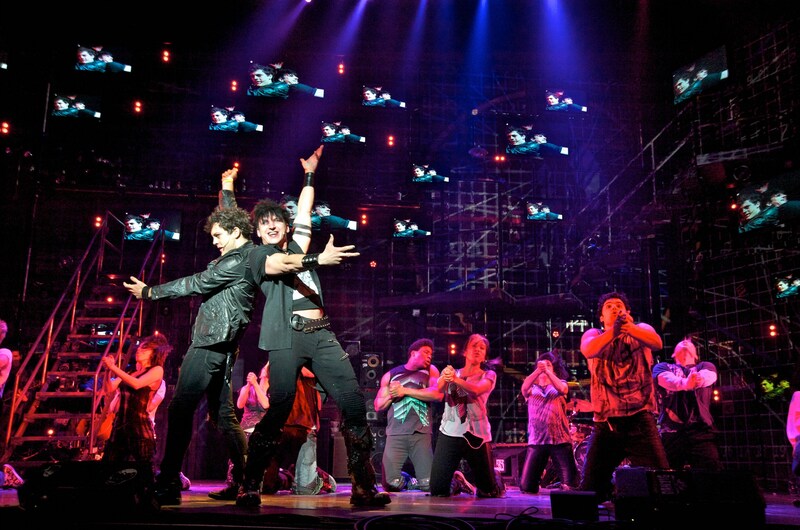 “The end of the world is over,” we’re advised in Green Day’s “American Idiot”, “and no one else seems to care.” That, in a nutshell, is the prevailing sentiment (if not the complete plot) of this explosive hit musical that can currently be seen at the Ahmanson Theatre in Los Angeles CA. 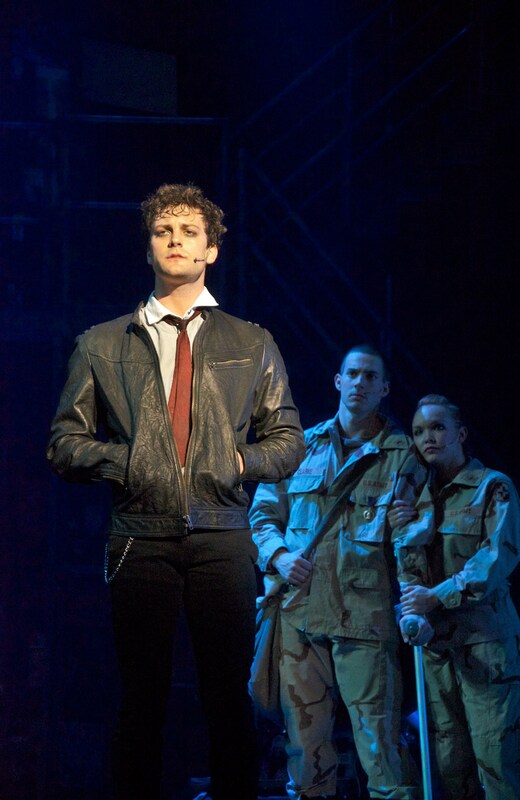 Based on the group’s Award-winning concept album and nominated for three Tony Awards “American Idiot,” tells the story of three friends who, each in their own way, strike out “across the alien-ation” in search of meaning in our post 9-11 world. Leading a talented and energetic team of performers, Van Hughes’ Johnny is amiable and relatable even when his situation isn’t. Our guide through this ‘brave new-wave under-world‘, Johnny spends his days, in his words, “Jerking off into oblivion” (–yes, the talk can be coarse at times but so are the sentiments they express.) Reminding us that “everyone’s heart doesn’t beat the same way,” Johnny and Tunny (played by Scott J. Campbell) flee “Jingle-town”, the stifling “City of the Damned” they call home in favor of the big city. Our boy Johnny, you see, has an axe to grind and it’s practically splitting his head open! Although at first he claims to have gotten the money for their trip by robbing a convenience store, he soon confesses that his mother actually bribed him with it in order to get him to leave! Once there, Johnny searches for love (or at least solace), finds a relationship with a girl known only as “Whatsername” (Gabrielle McClinton), and meets up with the seedy, malevolent drug-dealer, “St. Jimmy”. Much like the M.C. in “Cabaret”, “St. Jimmy” seems less of an actual character than the symbol of pure, wanton evil and it’s cleverly left for the individual spectator to decide whether he is, in fact, real or merely a figment of Johnny’s drug-fueled imagination. Either way, Joshua Kobak gives the role a thrilling and seductive presence! Scott J. Campbell is Tunny, who enlists when "His dreams turned Red, White & Blue"
Tunny, on the other hand, quickly grows bored and joins the military. Upon enlisting, he and the other recruits dispiritedly exit the stage much like prisoners in a concentration camp entering the gas chambers. Meanwhile, their buddy Will stays behind with his pregnant girlfriend. His is one of the trickiest roles in the piece as much of what he has to do is continuously sit–in full view–on a couch situated down-stage right. Fortunately, as Will, Jake Epstein possesses a voice as big as the Ahmanson has ever seen, so when his turn comes to react or vocalize, it’s well worth waiting for! Close to the climax of the trio’s isolated adventures, they are rejoined–at least spiritually–via the song “Wake Me Up When September Ends”. Afterwards, Jonny, deciding to straighten out his life takes a job in an office. Nonetheless, backed by a chorus of suit-wearing, ‘sensibly-dressed’ office workers, one can’t help but feel wistful as light projections like silent ghosts wash up, over and away from them, obviously signifying the renunciation of youth and freedom. Interspersed are some of the best, most evocative songs ever heard in a rock musical–among them, “Boulevard of Broken Dreams“, “21 Guns“, and of course, the rousing title number. Armstrong’s uncanny ability to find just the right word to describe or touch the right emotion easily ranks him among such other esteemed rock-poets as Jim Morrison or Bob Dylan. (Look extra close and you’ll see that several in the ensemble are done-up to look like him and band-mates Mike Dirnt and Tre Cool.) Here, such dynamic lyrics benefit beautifully with their added staging. The choreography by Olivier Award-Winner, Steven Hoggett consists largely of modern mosh pit moves and other contemporary tribal-like dances with many executed in unison by the entire company. There’s also a breath-taking dream ballet between Tunny and “The Extraordinary Girl” (Nicci Claspell,) an army nurse with whom he will fall in love, staged as a stunning and surreal pas-de-deux in mid-air with both suspended high above the stage! 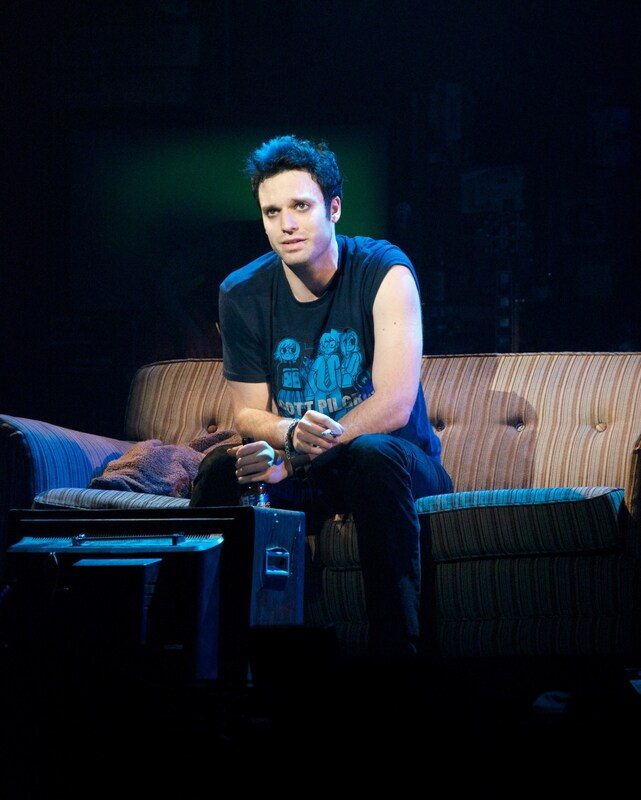 "Tales from another Broken Home": Jake Epstein As "Will"
As emotionally charged as a show can get, this might not be a ‘feel good” musical but it’s an important–even profound one. Speaking loudly to today’s audiences–from the young themselves, to those who still remember enough to feel memory’s sting from their own misspent yesterdays–all are bound to leave feeling more appreciative of what they have and have had–the good, the not-so-good and the painful included. 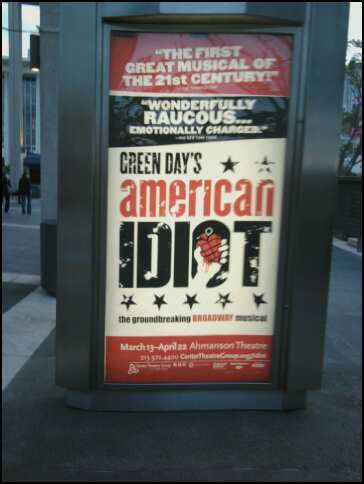 “American Idiot” opened March 13 and will run through April 22, 2012 at The Ahmanson Theater located at: 135 North Grand Avenue, in Los Angeles. Tickets are available online at www.CenterTheatreGroup.org, by calling (213) 972-4400, or in person at the Center Theatre Group box office at the Ahmanson Theatre at the Music Center. This one most definitely will appeal to a broad cross section of theater-goers–provided they are willing to open their minds to it; then, it’s nothing short of a work of genius! So come and surely you too, will have the ‘time of your life‘! 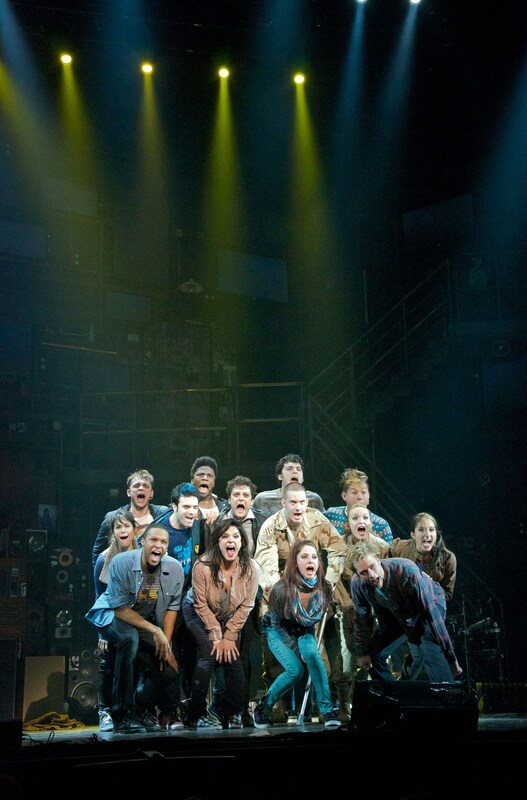 Young but NOT sophomoric: The National Touring Company Of Green Day's "American Idiot"
This entry was posted in Theater reviews and tagged "American idiot", 21 Guns, Ahmanson Theater, Billie Joe Armstrong, Boulevard of Broken Dreams, Extraodinary Girl, Green Day, Jake Epstein, Jesus Of Suburbia, Joshua Kobak, Los Angeles Theater, Michael Mayer, Nicci Glaspell, Rock Musical, Scott J. Campbell, St. Jimmy, Steven Hoggett, Van Hughes, Whatsername. Bookmark the permalink.